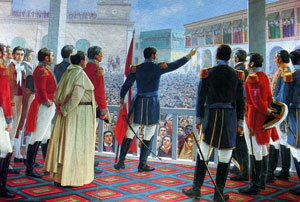 Peru celebrates Independence Day on July 28th each year celebrating their independence from the Spanish Empire in 1821. Peru had been colonized by Spain since the 15th century and had many loyalists loyal to Spain in the 19th century that supported staying in the Spanish Empire. Peru started military campaigns against Chile's attempt to become independent and lost the war with Argentina and Chile joining forces to defeat Peru. Upon entering Lima the Argentinian general Jose San Martin declared independence for Peru on July 28th, 1821, later in 1824 in the battle of Ayacucho actual independence was achieved.